The Palace Amusement Company (1921) Limited was formed by Audley Morais, and operated as a Private Company prior to 1921 (silent movie days). He re-formed the company and offered shares to the public in 1921. Over the years the Company operated Movies, Rose Garden, and Palace Cinemas. Gaiety and Majestic was subsequently acquired, Odeon (Mandeville) was leased, and other cinemas ( urban and rural) were built. It operated cinemas and distributed films to many of the independent cinemas that existed in Jamaica and Cayman. In 1938, Cinema Company of Jamaica Limited built the Carib, in competition to Palace. In 1947, J. Arthur Rank, from the United Kingdom, bought control in Palace Amusement Company. The Rank Organisation bought out Cinema Company of Jamaica Ltd. owner of the Carib. J. Arthur Rank closed the Movies and built Odeon in Mandeville in 1951, and Odeon in Half Way Tree in 1952. In l949, Russell Graham built the Tropical Cinema Company, and used it as a centerpiece of the competition that he mounted for the movie audience against Palace. In 1962, Russgram Investments Limited - a Company owned by Russell Graham - bought the controlling interest in Palace Amusement Company from J. Arthur Rank, and Douglas Graham was appointed Managing Director. The new regime purchased the Majestic Cinema on Spanish Town Road, built the Harbour View Drive In as a partly owned subsidiary, and took control of Tropical Cinema Company, which was a 2-cinema company - Tropical and Rialto. In 1989, Russell Graham sold his Russgram Investments Company to Douglas Graham, who still has ownership of it. Palace Amusement Company is listed on the Jamaica Stock Exchange and has approximately 150 shareholders. There are l,437,028 issued stock units. Russgram Investments Limited presently owns 66% of the shares in Palace Amusement Company. At this time we operate the Carib 5 in Cross Roads, Palace Cineplex in Liguanea and Palace Multiplex in Montego Bay. In Film Distribution, the Company also distribute films to Cove Cinema in Ocho Rios and Caymana Bay in Grand Cayman. We represent United International Pictures, which is the source of motion picture product from the studios of Paramount, Universal, DreamWorks and Disney. Russgram Investments Limited is also in the film distribution business, and represents Warner Bros., Sony, and 20th Century Fox. 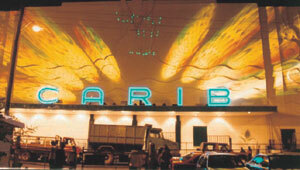 The Carib was demolished by fire in 1996 and Palace Amusement Company rebuilt it as 5 screens. Palace Amusement Company is managed by Douglas Graham, Executive Chairman; Carol Lee, Financial Controller; Scott Graham, Assistant General Manager; Melanie Graham, Marketing Manager; David Chong, Chief Engineer; Gillian Crosskill, HRD Manager; Steven Cooke, Concessions Manager, Shawn Smith, Chief Technical Officer; Trace Clarke, Internal Auditor and Nedra Bailey, Company Secretary (Company Services Ltd.). Directors: Douglas Graham, (Chairman); Elon Beckford (Vice Chairman); Hugh Levy; Melanie Graham; Douglas Stiebel; Scott Graham; Steven Cooke; Brian St. Juste; Heather Facey. These advances in the industry came in the form of optical (the quality of the picture) and audio improvements (the sound system used). In the mid 1950s, movies were shown with Cinemascope technology that used a wide angled lens to deliver the picture on a curved screen. It offered good quality sound with either a black and white or color picture. Magnetic Four Track Stereo was developed by the end of the 1950's that revolutionized the sound in all cinemas. For the first time, the audio could be reliably heard in stereo, that added clarity to dialogue and enhanced sound effects. A major setback suffered by this system was that there was no way of controlling the sound. Voices and sound effects could be heard coming from behind the audience instead of from the actors, giving the impression that there was an echo. In the 60' s Todd American Optical (Todd A. O.) was introduced to the Jamaican cinema, giving the benefit of American technology, which included the use of 70mm film instead of the standard 35mm film. The 70mm film delivered a brighter and sharper picture on the screen, but the necessary equipment was expensive, and few films were being recorded on it. This limited the movies shown in the cinema as all other films were still being recorded on 35mm. Todd A. O. did not last, and Cinemascope technology with 35mm film returned to the cinemas, and was used for a while. Since 2009 we converted all analog projectors to digital - away with films and mechanical projectors which has served us from silent pictures to date. Dolby Surround Sound Stereo came in the 1980' s which made motion picture sound a new experience. Speakers were now surrounding the audience which greatly enhanced the sound effects from all angles pulling them closer to the action on the screen. 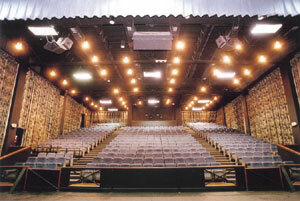 Dolby's noise reduction system eliminated the hissing and crackling in the sound that plagued the previous systems. Today, Digital Sound is used along-side Dolby.This new equipment uses computerized technology to not only enhance what Dolby provides, but also allows the audience to hear every spoken word and every sound effect with absolute clarity, making the experience as close to reality as possible. Since then we have also had two (2) upgrades of sound, and today Carib has amplifiers which will be rare for the next 5 years, in the motion picture industry. This too has us ahead of the best that is offered for homes or vehicles.